Chain maille jewellery desrives from the ancient art of building armour by linking small rings ("weaving") to form a pattern or mesh. Although commonly attributed to the battlefields of the Middle Ages, chain maille can be traced to the early Celts as well as the Etruscans (as early as 4th century BC). Today, maille work continues as a component in body armour or cut-resistant gloves. 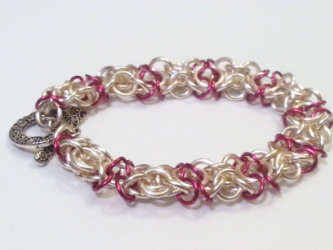 My work in chain maille involves the use of old and newer patterns and weaves to create hand-crafted pieces of jewellery. The examples you see here include aluminium, copper, bronze, jeweller's brass, niobium, sterling silver, stainless steel, and silver-filled rings. Each has its own properties relative to strength, weight, durability, tarnishing, etc. (A future page on this website will delve into the relative differences of the materials). Aluminium, for example, is remarkably light and durable if given the proper care. Niobium, although on the expensive side, is completely hypo-allergenic and has a reflective property that glistens in certain light. One supplier that I use makes an amazing "rosy" bronze that resembles a soft gold, but is easier (and less expensive) to work with. In certain circumstances, a particular weave may be more durable in one material rather than another, in which case I will advise accordingly. Metal clay was invented in Japan in 1990. It's almost like modern alchemy -- it looks and shapes just like regular clay, but dries out much faster. Pieces are refined and sanded before firing either in a kiln or with a hand-held torch. During firing, the clay component burns away, leaving nothing but 99.9% silver. By comparison, sterling silver consists of 92.5% silver and 7.5% other metals, usually copper. I've found silver clay to be a very flexible medium. By using small cutters from cake decorating and patterns ranging from rubber mats to wall paper samples, I can create interesting pieces such as charms, rings, pendants, or earring dangles. I can also create keepsake charms, such as a baby or child fingerprint - a great gift for new moms! The silver leaves you see in the photos were made by patiently applying a thin layer of silver clay paste to a real leaf, and then repeating once dry. The process is then repeated again several times over multiple days. This technique requires extreme patience and precision, but the end result is a solid silver piece with the fine detail of the real leaf. Kumihimo is the traditional Japanese technique of braiding. Originally strands of silk Kumihimo were used by Samurai as laces for their armour. Today it has evolved in the jewellery world. I currently use nylon satin for my cloth braids which are then turned into necklaces or bracelets. The Kuhihimo braiding technique also works well with small beads, resulting in flexible pieces of jewellery in an array of colours. Note the long necklace with flower beads in the second photo, in shades of lavender - there are 1,000 beads, hand-strung and woven together to create this piece. Kumihimo can also be created using thin wire (4th photo) or mixed materials. I recently purchased some metallic silk threads and pale shades of hemp cord for a bit of experimentation. During one of my recent trips, I obtained a few Murano glass pendants which will look lovely when hanging from satin necklaces. Seen on the catwalks at all the major fashion shows, resin jewellery is very much "en vogue" at the minute. Larger, statement pieces can be made entirely of resin (usually with items embedded inside, such as beads, feathers - nearly anything). I currently prefer to work with resin more as a decorative medium. I have found a good quality producer of fabricated pieces with "cups" or bezels, made for the artist to complete with cabochons or enamel. The enamel work allows me to work and experiment with colour, with an additional finish of a secondary, clear resin to add that special "dome" effect. The photos currently on display are some pieces in progress. Most are now finished, but I haven't had the time to photograph them individually yet. More to come! As a child, I learned how to do basic knitting from my aunt. Over the past year, I've been experimenting with knitting and crochet with thin wire to create necklaces and bracelets. The great thing about soft wire jewellery is that you can "play" with the piece once finished, either by re-positioned a bead or changing the relative length/thickness by bunching the wire. Any good jewellery artist has to have basic skills in wire wrapping, as this is a required skill for wrapping beads or cabochons. It's all about practice, practice, practice. I also experiment with more challenging wire wrapping, such as creating rings or bracelets wholly from thicker strands of wire. Ebru is an ancient Turkish/Islamic art of "marbling" papers. It is believed that Ebru started in the 13th century in Turkestan, moving to Anatolia through Iran. It grew in practice and popularity alongside calligraphy during the Ottoman empire. The oldest example, estimated from 1447, can still be seen on exhibit in Istanbul at the Topaki Palace. All products used in traditional Ebru are natural, which is the way I learned and practiced. Water is mixed with carageenan (a seaweed extract) and allowed to set before being poured into the basin. All paints start as natural pigments, which are derived from rocks, plants, and soil, pulverised into a powder. The powder is mixed with water and ox gall to make a liquid paint. Brushes are traditionally rosewood with horsehair. The paint is "sprinkled" over the basin, floating on the top of the water. Needle-like tools and combs made of nails are used to create patterns and traditional motifs. I've found that small pieces of Ebru look stunning when placed in a 1" pendant, then topped with acrylic.